Business inventories rose in April while sales declined, according to the Commerce Department. The weakness in sales reflected a slump in factory orders, and the resulting increase in the inventory-to-sales ratio suggests businesses need to dampen production and stockpiling to adjust to slower demand. Separately, the Commerce Department reported that May retail sales rose the most in three months, exceeding analysts’ forecasts and signaling consumer resilience despite tax increases and slow wage growth. Automotive sales led the gain, and eight of 13 retail categories advanced. The moving four-week average for initial unemployment claims fell for the first time in five weeks. Labor Department data showed jobless claims hovering slightly above their levels a month ago, which were the lowest in more than five years. Generally, employers have been reluctant to let workers go but also haven’t been adding enough new workers to significantly improve the employment picture. The rate of inflation at the wholesale level rose more than analysts expected in May led by food and energy costs, The Bureau of Labor Statistics said. The Producer Price Index indicated a 1.7% annual inflation rate – both with and without the volatile food and energy categories. The rate suggests that demand for goods on the wholesale level remains weak enough to support continued monetary stimulus from the Federal Reserve. Industrial production stayed unchanged in May, reflecting a recent slowdown in the sector that helped revive the U.S. economy from the recession. Output from utilities slumped for the second month in a row, and manufacturing managed a slight gain – its first in three months, according to the Federal Reserve. 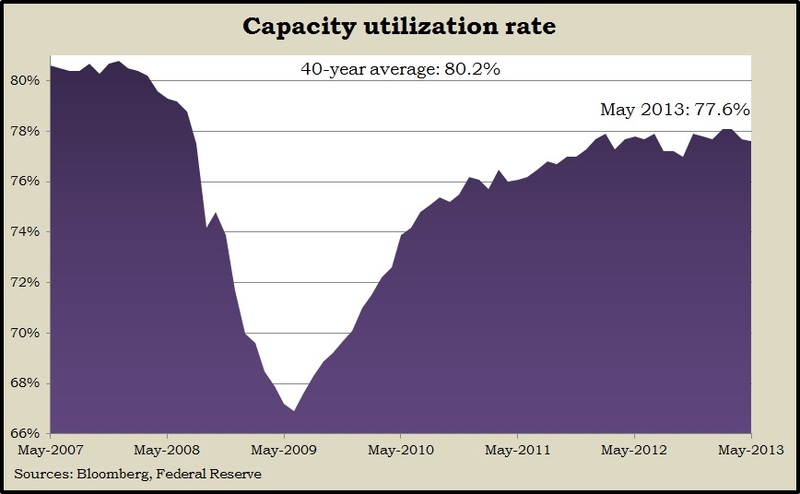 Capacity utilization fell to the lowest level since October and remained well below the 40-year average rate, which suggests the economy still has room to grow before inflation becomes a threat. A preliminary read on consumer sentiment by the University of Michigan and Thomson Reuters showed outlooks rising to nearly the highest level since the recession ended in June 2009. However, consumers’ lower opinions of current economic and personal financial conditions brought down the overall confidence level.